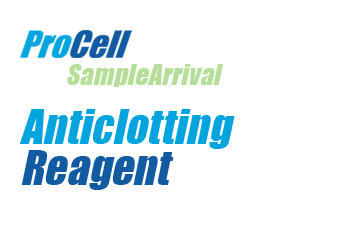 Anti-clotting Reagent is a newly developed product, consisting of a mixture of enzymes that actively break down the proteins that compose blood clots. Blood clots are hence quickly dissolved in precious cytogenetic samples, such as bone marrows and blood specimens that arrive clotted at the laboratory. This product does not contain any streptokinase, which can be toxic to cells. Most clotted specimens that were previously lost due to clotting can now be rescued. Valuable bone marrow specimens arriving in containers with inadequate heparin can now be used to obtain metaphases, removing the requirement for repeat sampling in many cases. Follow Procedure 1 for bloods and bone marrows. Anti-clotting Reagent is also effective on solid tumours, lymph node sections and CVS. These specimens often contain blood clots that hinder growth of the required cell type. Tests show that indirect CVS treated with Anti-Clotting Reagent are ready an average of 2 days earlier. Anti-clotting Reagent will also help to break down the tissues so colonies can be established more rapidly. Follow Procedure 2 for solid specimens. An enzyme mixture designed to actively and rapidly break down the proteinaceous components of blood clots, thus rescuing any precious specimens arriving in non-heparinised containers and reducing the need for repeat sampling. This product does not contain streptokinase (known to be toxic to cells). ACR has been found to very effective for the fast and safe removal of maternal blood clots from CVS. There is some evidence showing that treatment of CVS with ACR actually reduces reporting time. 2. Meanwhile centrifuge the clotted specimen in its original collection container for ten minutes. 4. Incubate the specimen in a 37 degree Centigrade water bath until no clots can be seen. 5. Most clots dissolve within five to ten minutes. 6. When clots have dissolved, centrifuge the specimen for ten minutes. 7. Discard supernatant and wash twice with culture media, centrifuging between each wash. NOTE: This procedure should be used alongside a control. 2. Working with the sample in a Petri dish and making observations under an inverted microscope, add the 5 mls of Anticlotting reagent to the sample. 3. Wait for 5-10 minutes, under the microscope the blood clots should be seen to dissolve and the surrounding solution should become red in colour. 4. Pipette away all the debris and blood. 5. Wash 2-3 times in PBS, pipetting away the solution each time. 6. Set up the tissue in culture as normal.